Google has brought a few of KitKat’s features It's Official: Nexus 5 And Android 4.4 KitKat Are Here It's Official: Nexus 5 And Android 4.4 KitKat Are Here The Nexus 5 is now on sale in the Google Play Store and it's running the brand new Android 4.4 KitKat, which will also be rolling out to other devices "in the coming weeks." Read More to older devices running Android 4.1 Jelly Bean and above, with an update to the Google Search app on Android. While there are plenty of reasons to care about Android 4.4, the Google Search update mainly concentrates on the Google Now feature and includes the ability to easily get the Google Experience Launcher. The new update also brings the “OK Google” command to Android to activate a voice search, which was also recently brought to the iOS app. There are a bunch of new ‘cards’ that you can use to find out information about anything you want. For example, if you follow certain blogs or websites, the Website update card acts like a mini RSS reader to ensure you never miss an update on the site. Similarly, by setting a few subjects and issues that are important to you, the News topic card will keep you informed with fresh articles from around the web on those talking points. If you are more of a pop culture nut, then the What to watch card gives you Movie and TV recommendations so you know what to queue up next. And in a similar manner, you can follow sports scores too. “All card settings and toggles have been reworked into a series of menus and yes/no questions – just tap the wand at the bottom of Search to access them,” Android Police notes. Additionally, if you dismiss any card, you can bring it back just by tapping the ‘Undo’ button. Apart from that, the new update shows you real-time traffic updates using Waze (where available), and you can track when your packages are ready for an in-store pickup. Finally, the Google Search update lets you set recurring reminders. The best part is that you can now easily get the Google Experience Launcher (GEL). 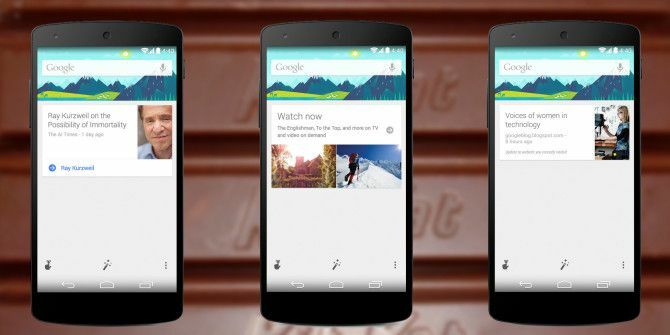 When we wrote about it, GEL was among the KitKat features you can get right now Don't Wait: 5 Great Android KitKat Features You Could Get Right Now Don't Wait: 5 Great Android KitKat Features You Could Get Right Now A few of KitKat's coolest features are available right now, either through official APKs or third-party apps. Read More , but the process was a little drawn out. Now, after you install the Google Search update, just download and install the APK from this link and you’re good to go. Google Search should update automatically or you can grab it manually from the Play Store.